Can someone tell me where the 12v fresh water pump switch is located on my new thor ACE 29.3 motorhome?? On the control panel with all the other switches and tank indicators. 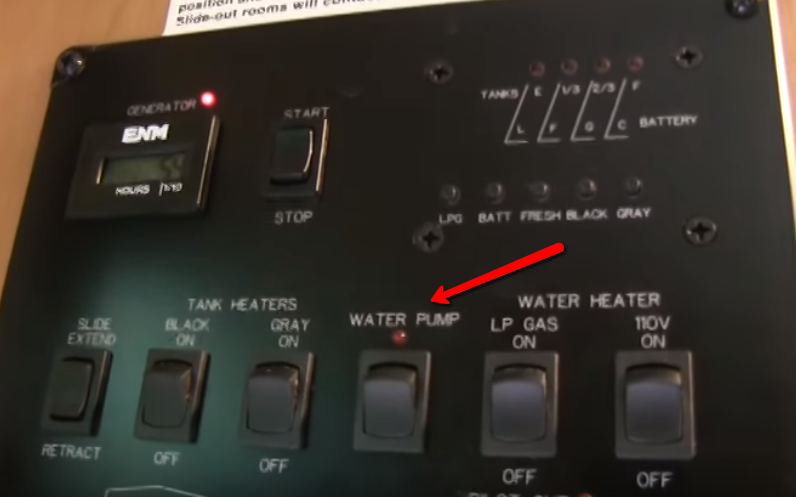 Thanks, it is somewhat confusing a it is next to water heater Gas switch and under the heading "Water Heater". It is the one on the far right as you face the panel. I added an extra switch by the sinks so I can turn the pump on or off at either place. When I checked the panel I found that the original switch is a on on type. Ran a wire from the extera terminal to my new switch. It is also an on on so that I can control the pump from either, works like the interior lights. It would be up to you do do or find a mechanic to wire it in. No, that's the electric water heating element. It is to the left of the water heater swiches.